It is with great pleasure to announce, that Dr. Ralf Mayer, Founder & Executive Consultant of San-Ten Consulting, had been invited again to support the “Master of Business Engineering” program of Steinbeis University in Japan. This time even with two lectures: The established lecture Eating Peas with Chopsticks: Mastering Business in Japan about the impact of cultural differences between Germany and Japan on business life and how to resolve it. In addition, Dr. Mayer also gave some insights into International Marketing & Management and how culture can be recognized and implemented into a marketing strategy. Beginning of March 2019, about 30 students from Germany and 20 students and company employees got together in Kanagawa Science Park to work together in groups on market entry projects from 3 Japanese companies. In the group work, the students discuss and develop cross-border market entry strategies for either German products to Japan or vice versa in international teams. Besides the team work on real-life marketing challenges, the inter-cultural exchange and experience is in focus for the 10 days in Japan. Giving this opportunity to close experience of cultural differences and how to overcome them will enable the students to much better understand but also to master future business issues in an international context. Besides the group work, the students receive supporting lectures from international professionals, of which Dr. Mayer could provide two. Eating Peas with Chopsticks is focussing on general cultural differences between the two countries and how they impact business life. In particular, how the decision making process works in Japan, what time frame is needed and how disagreement is articulated is extremely important to understand for successful business in Japan. 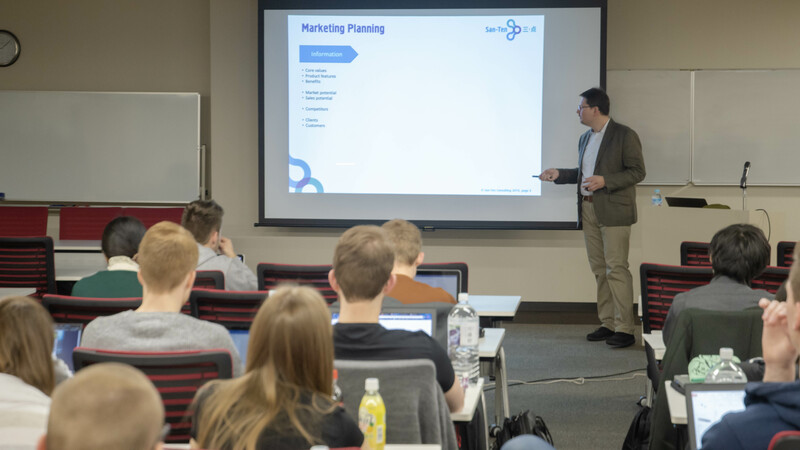 The second lecture about International Marketing was aiming to create an understanding of the effect of cultural differences on buying decisions of consumers as well as professional buyers and how they can be implemented into a marketing strategy. Examples of successful cross-border market entry and failing companies ignoring local culture complemented the theory with real-life experience. Since it can be difficult for foreign companies with no experience in the Japanese market to cope with all the cultural differences and peculiarities, San-Ten Consulting offers a broad range of support and consulting for a successful market entry in Japan. For example, our JUMP Assessment can be a valuable first step to get a clear picture of your possibilities and potential in Japan. Likewise, San-Ten Consulting also supports Japanese companies that want to do business overseas and avoid mishaps.